All you can do now is point out that giving up medicine was my greatest gift to the human race, if one considers the number of people who are walking around now who wouldn't be if I'd been a doctor. On the other hand, if I'd been Margaret Thatcher's doctor, I might have been able to save my compatriots a lot of misery by the administration of certain drugs or insisting that she needed drastic brain surgery. .
That is Robert Simpson writing about his aborted medical training in a 1991 letter*, and his wry concluding comment has a topical relevance to politicians on both sides of the Atlantic. A recent Overgrown Path thread extolled the virtues of mono sound, and the CD transfer of Robert Simpson's First Symphony on Warner's 10 CD overview of Sir Adrian Boult recordings confirms that when it comes to technology less is more. On the LP above the coupling is Peter Racine Fricker's Second Symphony. 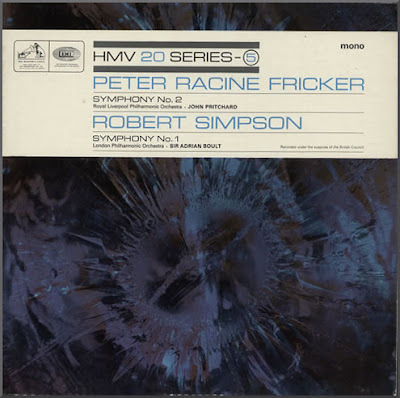 The neglect of Fricker's music - which by contrast with other British composers of his generation was influenced far more by the central European musical zeitgeist - is even more scandalous than the neglect of Robert Simpson's. In Contemporary British Composers Francis Routh writes that "Few composers have experienced quite such a cruel reversal of fortune as Peter Racine Fricker. Fashion, it would seem, has used him almost as her plaything, to take up or discard at whim". For those suffering from Mahler and Shostakovich fatigue, Warner's reissue of the Sir Adrian's 1952 mono recording of Simpson's First Symphony - the producer incidentally was Lawrence Collingwood - and Lyrita's stereo CD of Colin Davis conducting Fricker's Fifth Symphony - what is it about Fifth Symphonies? - are perfect restoratives. * Quotation is from Donald Macauley's self-published The Power of Robert Simpson: A Biography. No review materials used in this post. Any copyrighted material is included as "fair use" for critical analysis only, and will be removed at the request of copyright owner(s). Also on Facebook and Twitter. 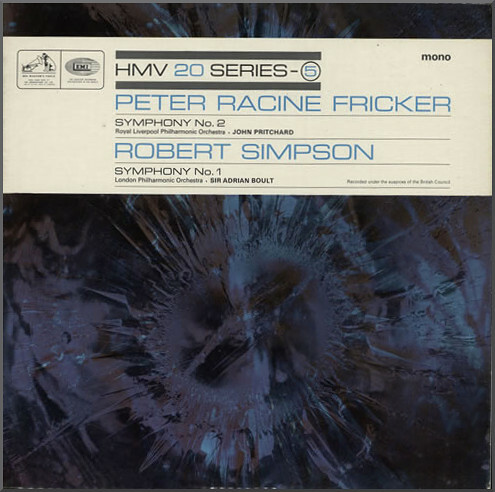 The HMV/EMI coupling of the Simpson and Fricker symphonies was transferred to CD. But the disc is deleted, although copies can be found at scalping prices. To fill out the CD a symphony from the Scottish composer Robin Orr - whose music also needs championing - was added. Shostakovich fatigue? I don't know what that is. "Listener fatigue (also known as listening fatigue) is a phenomenon that occurs after prolonged exposure to an auditory stimulus. Symptoms include tiredness, discomfort, pain, and loss of sensitivity. Listener fatigue is not a clinically recognized state, but is a term used by many professionals. The cause for listener fatigue is still not yet fully understood. It is thought to be an extension of the quantifiable psychological perception of sound. Common groups at risk of becoming victim to this phenomenon include avid listeners of music and others who listen or work with loud noise on a constant basis, such as musicians, construction workers and military personnel." But I wouldn't want to be accused of hijacking your very admirable highlighting of the genuinely neglected. I will look up Fricker - new name to me.